This entry was posted on March 8, 2015 at 12:13 pm and is filed under Independent Foreign Fiction Prize 2015, Jenny Erpenbeck. You can follow any responses to this entry through the RSS 2.0 feed. You can leave a response, or trackback from your own site. Great review, Grant. Your first quote and accompanying commentary stopped me in my tracks – it’s so arresting. I do want to read this book, but it’s possibly a little bleak for where I’d like to be in the next few months. One for the later in the year perhaps. Does this one count towards your #TBR20? If so, I suspect you’ve chosen wisely – I wouldn’t be surprised to see it on the IFFP longlist! It wasn’t on my original ##TBR20 list but I decided to read it in an IFFP panic! If I’d had any sense I would have made sure my 20 books were all eligible for the prize. I do hope it’s on the list, and not just because I’ve now read it! I think she’s a wonderful writer. I’m not sure why, with such bleakness, this book is also so very poignant. It touched me to the core, perhaps partly because Erpenbeck’s writing was able to connect me to so many aspects of myself: daughter, mother, wife. Those parts were even moreover piercing to me than the Jewish aspect, for which I have no personal connection. However, I do read the Bible every year, and I loved her use of Scrioture, as well as her reference to Lot and his wife. First, that she should not have looked back and become a pillar of salt; secondly, when the Angels come to Lot’s house and the evil townspeople want to have their way with them. So interesting that she would use Lot’s story from the Old Testament in her modern book. Of course, those Biblical stories never grow old becuase of all the truth they contain. I wonder – does Lot’s wife remain anonymous as the central character in The End of Days does? Although having no personal connection to either the Jewish or female facets of the novel, I would agree that I felt the novel was more about the experience of being female. 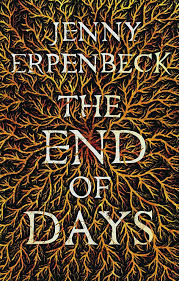 I think it is Erpenbeck’s style which makes the bleakness both heart-breaking and bearable (which suggests she has been wonderfully translated by Susan Bernofsky). Absolutely! It’s a beautiful translation from what I can tell, not knowing German.